If there’s a lesson emerging from the scandal in the US or from Game of Thrones, it’s that details matter. At least in the case of the US, the details are emerging and in the process, the spin doctors are working overtime to shape the conversation. While this may seem like a leap for the online trading world, in reality, the lesson for DIY investors when considering online brokerages is to try and see past the spin and to focus on the details. Fortunately, this edition of the roundup is chock-full of details as we take a deep dive into the latest rating of Canadian discount brokerages to be published. From there we provide an update on the latest insight piece on one Canadian online brokerage’s venture into sustainable investing. Wrapping up this week will be a collection of the many interesting (and sometimes colourful) DIY investor conversations that took place on Twitter. For many DIY investors and those looking for a quick answer to the question: “who is the best online brokerage in Canada?” the answer appears to have evolved over the years. The shift appears to evolved from finding a singular ‘best’ online brokerage, to providing a category-based approach to report on discount brokerages who are the best at particular features. Such is the case in the latest MoneySense ratings of Canadian online brokerages, which were published this past week. Based on data supplied by financial services research firm Surviscor, the latest online brokerage rankings suggest that when it comes to the “best overall” experience for online investing, non-bank-owned online brokerages are edging out their larger and better financed competitors. Starting first with the ‘winners’ (beware the spoiler alerts). BC-based Qtrade Investor earned the top pick as best overall brokerage followed by Questrade which earned the runner up title of ‘honourable mention’. In the bank-owned brokerage category, BMO InvestorLine and Scotia iTRADE tied for top pick with no runner up (or ‘honourable mention’) reported. For followers of the MoneySense online brokerage rankings, there is an air of familiarity about the winners this year compared to 2016. Both Scotia iTRADE and BMO InvestorLine were rated as the best and ‘runner up’ bank-owned brokerage, while Qtrade Investor and Questrade took first and second place in the non-bank-owned online brokerage category respectively. So, as far as the top contenders are concerned, things look largely the same as they did last year. A few notable changes, however have shown up in the 2017 analysis. A quick scan of the results between last year and this year will show some new faces in certain categories, but by and large, this year’s MoneySense online brokerage rankings show a high degree of similarity to 2016. Nonetheless, as we’ve mentioned time and again on SparxTrading.com, when it comes to evaluating the online brokerage rankings, it is important to look at the details and critically evaluate the findings to ensure a more thorough understanding of what’s behind a rating or ranking. Perhaps one of the most immediate observations is that there are some brokerages that make multiple appearances across different categories. Specifically, although 9 different brokerages were mentioned in at least one category this year, either Qtrade Investor or Questrade were first or second a combined 9 times out of 17 possible mentions. And, while that does make sense given the overall rankings of both of these online brokerages, when compared to the profile of results from 2016, it is notable that for the bank-owned online brokerages, Scotia iTRADE is far less visible in the top or runner up spots in 2017 than in 2016, despite landing a tie with BMO InvestorLine for top bank-owned online brokerage. A closer look at the 2017 results reveals that of the top two bank-owned online brokerages, only BMO InvestorLine managed to achieve the best in the category of reporting and record keeping while Scotia iTRADE did not make a top pick or runner up in any of the categories mentioned. Curiously, despite TD Direct Investing placing in top spot for ‘market data’ and runner up for ‘getting started,’ it did not make the cut for best bank-owned brokerage or even ‘honourable mention’ according to the results. Shut out from winner or runner up circles from this year’s rankings were Credential Direct, HSBC InvestDirect, Laurentian Bank Discount Brokerage and RBC Direct Investing. Also overlooked again this year was Interactive Brokers Canada, which was excluded from consideration and almost certainly would be a challenger in the fees & commissions, getting started, and market data categories. One of the most crowded categories, curiously, was the commissions and fees spot. Top pick for fees this year was a tie between CIBC Investor’s Edge as well as Questrade, while honourable mention (another tie) went to Qtrade Investor and Virtual Brokers. Given that commission pricing changes at CIBC Investor’s Edge appears not to have dramatically changed since we first reported the drop 2014, it was strange to see Investor’s Edge disappear from the 2016 ratings (while it did appear in 2015) but reappear in 2017. Likewise, commission pricing at Virtual Brokers has been restructured so that there is now standard commission structure pricing of 9.99 per trade, but Credential Direct (with standard commission pricing of $8.88), which was cited alongside CIBC Investor’s Edge as low cost by MoneySense in 2015, seems like it would have made the cut. The takeaway: commission pricing is low at many Canadian online brokerages and one of the important factors to consider is whether there are any ECN fees or not. While the MoneySense ratings do not disclose a full methodology of how fees and commissions are calculated, the big picture shows that DIY investors who want to buy based on commission pricing do have a number of choices for good value. Of course, the commissions and fees category is not without some controversy in this year’s ratings. A concern that we noted with the standard commission reporting, however, is that Scotia iTRADE’s “basic online equity” commission pricing is listed as $9.95, a condition which is true only if clients have more than $50,000 in assets at Scotiabank entities. If having at least $50,000 in assets is the qualifying definition for standard commission pricing at Scotia iTRADE, then HSBC InvestDirect should have their rate posted as $8.88 rather than $9.95. Conversely, if having the minimum deposit to open an account is considered the threshold for ‘standard pricing’ – which we would argue should be the case – then Scotia iTRADE’s standard commission pricing would be at least $24.99 per trade – almost 4x that of CIBC Investor’s Edge and easily double the $9.95 at most of Scotia iTRADE’s bank-owned brokerage peers. Again, without methodology detailing how these were calculated, the inclusion of Scotia iTRADE as a top pick with standard commission pricing so far above its peer group and no top pick or ‘honourable mention’ in any of the categories makes it a strange result. Unlike 2016, where Scotia iTRADE does appear in 3 categories as either top pick or ‘honourable mention’, this year’s inclusion in the winner’s circle at the bank-owned brokerage level seems less obvious as to why that would be the case. To be fair, we’re not trying to penalize Scotia iTRADE. In fact, we noted that there were some notable discrepancies from Scotia iTRADE’s details (at the time of publication) that would be of value for potential clients to take note of and which could shift the scoring in Scotia iTRADE’s favour. Specifically, Scotia iTRADE is better at customer service availability and investor education support than the MoneySense comparisons would imply. Another point of concern appears under the ‘buyer beware’ category in the MoneySense breakdown where it states Scotia iTRADE has “weak educational material.” The characterization as “weak” seems highly subjective and inconsistent with the fact that Scotia iTRADE has not only had a long-standing focus on investor education but even on the relatively recent redesign of their website, they committed to having education as one of the four main menu choices. Further, Scotia iTRADE also has learning modules on basic topics related to trading and platform orientation, and more importantly, they have an extensive calendar of educational events (such as webinars) that are presented frequently and regularly throughout the year. For a claim of ‘weak’ educational material to be applied to Scotia iTRADE to be substantiated, even on a relative basis, it would mean that the vast majority of Canadian online brokerages ought to be called out for the same ‘buyer beware’ drawback and even more so for not having these webinar/seminar supports in place. 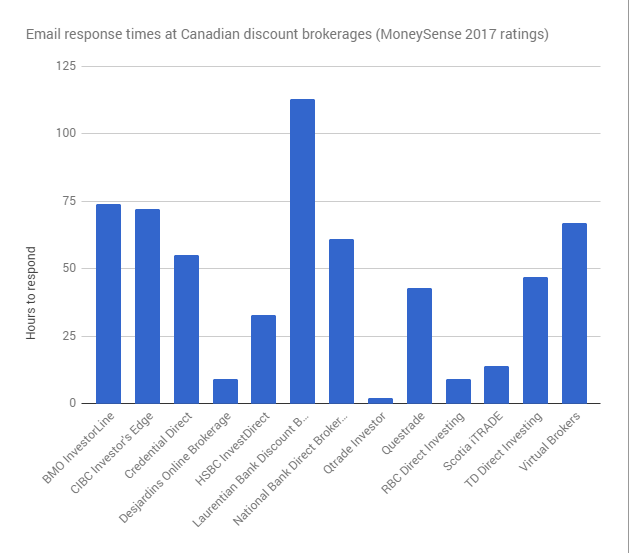 Another interesting aspect of the rankings and ratings is the customer service response times on email across the Canadian online brokerage industry. Surviscor regularly monitors the email response times for Canadian discount brokerages and has reported this data as part of its Service Level Assessment (formerly the Customer Email Responsiveness program) scoring. Included in MoneySense’s online brokerage rankings this year was a particular focus on email performance, and in particular, how poor the industry (with a few exceptions) is doing when it comes to responding to requests via email. The range reported from this year’s analysis was substantial. Qtrade Investor was the quickest to respond with an average of just under 2 hours while Laurentian Bank Discount Brokerage came in at 113 hours. Given the staggeringly high variation, it would have been nice to have the standard deviation and number of emails sent to each firm reported. Averages, in and of themselves, are of limited value when trying to figure out “what’s normal” or representative of a service experience. Another unknown which would add more context would be knowing how many emails were sent (was it 3 or 30? ), when they were sent (Friday nights, weekends or during market hours)? and what qualifies as a response (did the question get answered or was the note simply acknowledged as received?). Another interesting observation was that the figures reported for Desjardins Online Brokerage’s response time in the dynamic chart supplied show it at 9 hours, which is the same for RBC Direct Investing. That is relevant because Desjardins Online Brokerage managed to score as a ‘honourable mention’ for that score while RBC Direct Investing did not. It is likely the case that the reported chart is rounding numbers (since Qtrade Investor was reported in the text to have an average under 2 hours but is reported in the chart as 2 hours) but this clarification is one that becomes important, since rounding to the nearest hour is a significant amount of time in an online world. For many DIY investors, including readers of MoneySense magazine, navigating the maze of Canadian online brokerages is both time consuming and complicated. Ratings such as the latest online brokerage comparison provide a handy way to understand the strengths and limitations of particular Canadian online brokerages. 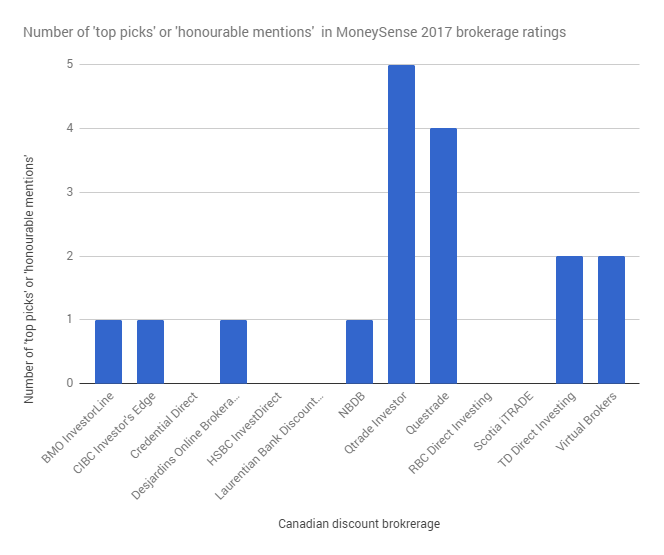 While the latest ratings don’t necessarily “rank” numerically where particular online brokerages stand, the MoneySense online brokerage nonetheless showcase a ‘top pick’ and an ‘honourable mention’. So, those DIY investors looking for a recommendation can find a brokerage worthy of consideration. In fact, a particularly nice feature for this year is the comparison tool which enables side by side comparisons of online brokerages. All that said, as has been stated many times on SparxTrading, it is important for readers and users of discount brokerage rankings to have clarity on what the categories being used mean as well as how they’re measured. The MoneySense online brokerage ratings rely heavily on data sourced from Surviscor’s analysis and as such, it might be useful to point readers to the methodology sections on the Service Level Assessment (which explains some of how the email testing is done) and also on the assessment for categories like user experience or commissions and fees. In sum, Canadian online brokerage account shopping can be as simple or complicated as DIY investors want it to be. To help make the task of figuring out what other rankings or ratings are saying (such as the MoneySense brokerage rankings or those from the Globe and Mail), we’ve added all the ratings received by a Canadian online brokerage onto the profiles of each individual brokerage (accessible in each online brokerage’s profile page). The best news for DIY investors coming out of these rankings, however, is that competition amongst brokerages is pushing at least a handful of them to put forth their best effort into winning new clients and keeping existing clients satisfied. For many investors, there is a growing trend towards thinking carefully about the impact and nature of where profits come from. Socially responsible investing is definitely gaining in popularity with investors and even this past week, there were headlines that major robo-advisors in the US were moving into this space by adding the SRI into their portfolio offerings. For DIY investors in Canada, however, there’s at least one online brokerage who’s taken the leap to provide a tool to research and analyze companies according to their environmental, social and governance (ESG) components. Earlier this year, Scotia iTRADE became the first Canadian online brokerage to launch this ESG tool for their clients. This past week, we profiled this tool in detail and provided a highlight of some of the issues that DIY investors might want to consider when using this tool, as well as whether this tool – itself a measure of controversy, might in fact also be a source of controversy in the Canadian online brokerage landscape. The ESG screener and associated reports enable DIY investors to investigate the ESG rating of hundreds of companies listed on the TSX in order to learn more about whether those companies fit within the investor’s goals of socially responsible investment decisions. Of course, while socially responsible investing is an idea that many can get on board with, in reality the definition of what this means and how it works exactly are important to know. In the world of DIY investing, in particular in Canada, there has been a discussion as to the nature and types of tools that order execution only brokerages can provide. Separately, events in the US with respect to fiduciary duties of money managers and advisors have also helped to colour the debate on social responsible investing – namely that it introduces a bias that may be at odds with the duty or objective to maximize the monetary benefit to the investor. Click to read the full story in the blog here. This week it looks like outages and advertising were the topics of choice for DIY investors on Twitter. Mentioned this week were Questrade, RBC Direct Investing, Scotia iTRADE, TD Direct Investing and Virtual Brokers. That’s a wrap on another week. Now that the weekend is here, hopefully there’s some sunshine to enjoy. Of course, for GoT enthusiasts, there’s plenty of winter to look forward to on Sunday and lots of watercooler talk on Monday. For a more real-life GoT experience, however, be sure to tune into CNN as the intensity level of the drama that is US politics ratchets up. On that note, now that ‘Spicey’ has left the building, here is a fun collection of memes commemorating the departure.